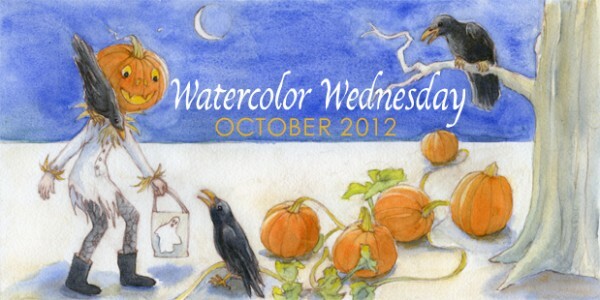 I wanted to do something fun for the October banner art slot for a great children’s illustrators’ blog called Watercolor Wednesday. Lots of gestural thumbnails later I came up with a Pumpkin head character in conversation with ravens in a pumpkin patch. My focus for this piece was loose watercolour and allowing space, trying out the idea that what is left out is just as important as what is left in. Oh, and another reason why I loved this project, I love Halloween!